After my first success with the Valencia, I decided to forge ahead and make a second top (the one that inspired me to get the pattern in the first place). 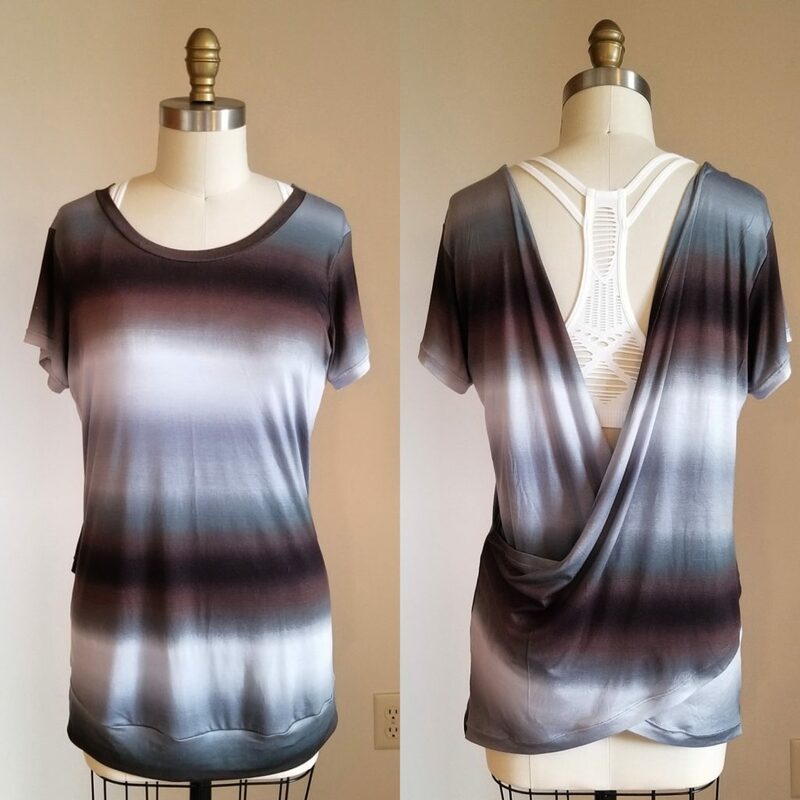 This time around I made the crossover back top with short sleeves in So Sew English’s Black Ombre Modal Spandex. Like the color block tee, the crossover back was easy to put together and came together nicely…. however, I wasn’t a fan of some of the finishing techniques used – namely how the back was attached to the front and the side seams (the front band is completed already when you sew the sides…. nothing is really wrong with them, I just prefer a cleaner finish. As for the fit, it seems a bit less fitted than the previous version – I am sure this is because of the draped back. I believe I could have gone down one size and I may have liked the look a bit better. I should also note that I did not add the strap across the back because I think it looks better without it and seems to stay up fine on it’s own. I don’t think this changed the fit any either. My only other complaint is that it is a bit longer than what I had expected – I think I would have liked the length better if it didn’t have the bottom band (something to play around with in future tops). Overall, I love the overall look of this top and can’t wait to wear it. I had planned putting this on for for a girl’s night out this past weekend, but of course the weather didn’t cooperate (it was darn cold again) so I had to opt for something warmer. This entry was posted in Uncategorized on April 3, 2019 by stacy. While I was waiting for my fabric to arrive, I decided to go ahead and test out New Horizon’s Valencia Top. There were a lot of different options for this shirt, but settled on a color blocked, short sleeved top with a curved hem. 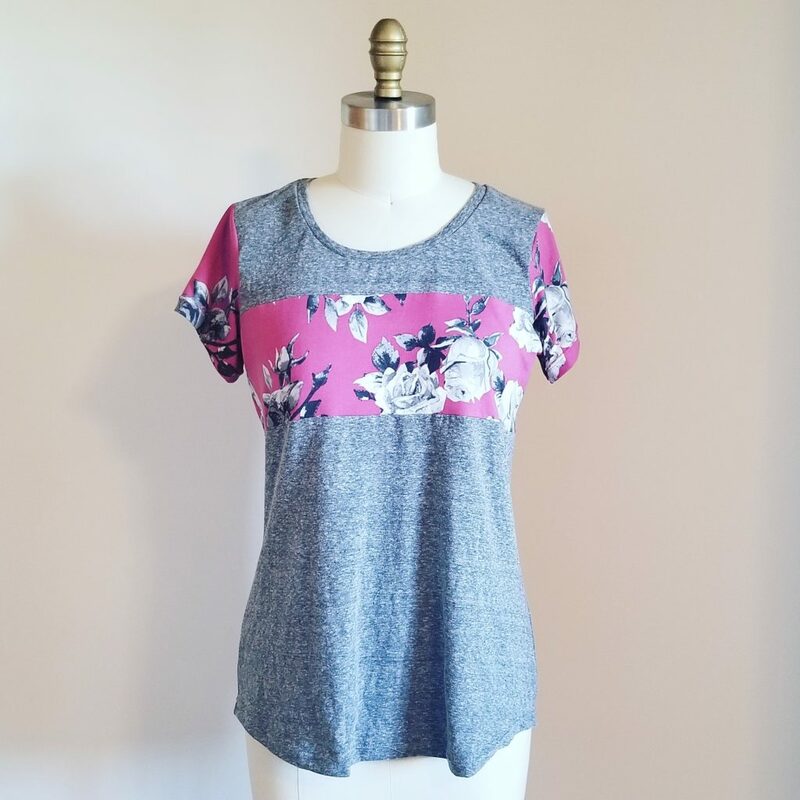 Since most of my (accessible) stash is pretty limited at the moment, I decided to use the same pink double brushed poly print that I used for the Discoverer Tee and Loggers, as well as a brushed gray cotton knit (that I am pretty sure I got from GorgeousFabrics several years ago). Sewing this one up was great – the instructions were easy to follow and the pieces came together perfectly. If I had to complain about anything it’s that the curved hem is so deep (1″) that it makes it difficult to press up, but honestly it wasn’t hard, it’s just that I couldn’t use Ezy Hem tool (if you don’t own one, you need to try it… it’s life changing!). As for the fit, I like it! It’s not body-hugging, but it’s not quite relaxed either (relaxed is in the description of this pattern)… it’s somewhere in between. Plus I really like this color block option – there’s so many possibilities! With that said, I see a lot more of the Valencia in my future! This entry was posted in Uncategorized on April 1, 2019 by stacy. Need a new tote to take to the pool this summer, carry your latest project, or just because? This color blocked version is perfect for any occasion and looks fun to make! While you’re visiting the site be sure to register to win a Sweet Caroline fat quarter bundle. If you’ve inherited lace doilys but don’t know what to do with them, you’ll definitely want to check out this pretty pillow project. This Easel Organizer project keeps everything you need at your fingertips and your instructions at eye level. Dressing up doesn’t mean sacrificing comfort when you make a pair of these paper bag pants. I love a good crossbody bag – especially in the spring and summer when we do so many outside activities, but I still need to carry a purse. What makes it even better is when the pattern is free! Does your little one need their own? This version is designed for toddlers. Learn how to create beautiful napkins with perfect mitered corners with this self binding napkin tutorial. Need a new top, but not time to sew one? This criss-cross cutout t-shirt refashion is a trendy no-sew look. Sometimes the occasion calls for an eye catching clutch – like this rose motif zippered pouch. The technique looks fun to try too. Get ready for warm weather by stitching up a tank dress. These placemats are a great fat-quarter project. This entry was posted in Uncategorized on March 28, 2019 by stacy. I had told myself “no new fabrics” until after we move, but I couldn’t help myself yesterday…. One of the admins (Barbie Slivinski) from the SoSewEnglish Facebook group had posted her version of New Horizon’s Valencia and I decided I had to have one too (I am fairly certain the bralette is the Mama Bridget). Needless to say I picked up a few yards of the black ombre modal (and another fabric that I and wanting to use for a different project) as well as the Valencia… and two other patterns. While I wait for my fabric to arrive (it should be here tomorrow! 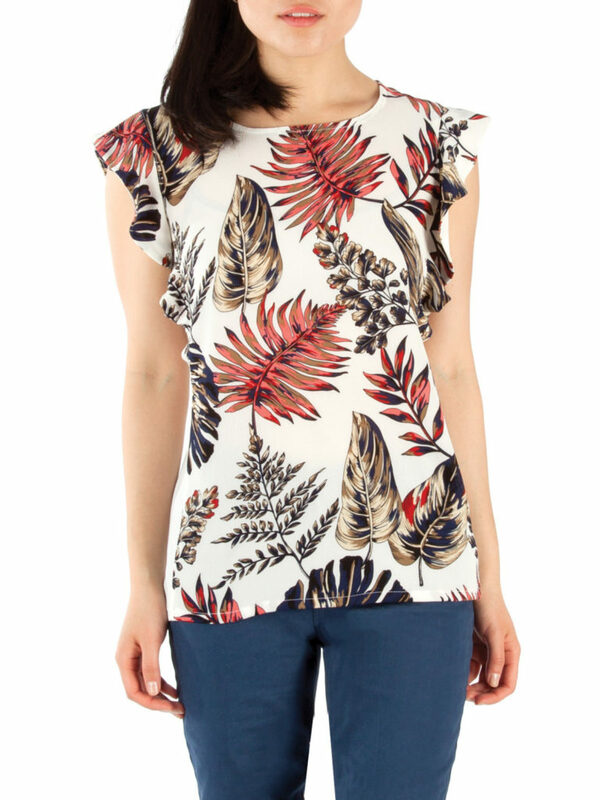 ), I think I may get the Cascade Tee ready for sewing. Yes, that’s right, I couldn’t resist another ruffle sleeve pattern! This entry was posted in Uncategorized on March 27, 2019 by stacy. This will be the LAST time I blog about the Logger pattern…. I promise! Since Taylor decided that she wanted to keep the last version I made for herself, I decided to make a second pair. This time I wanted a slightly heavier weight material, so I opted for a camo French terry from Knitpop (I did buy the last 2 yards of this material, but noticed that SoSewEnglish had pretty similar material on their site). This particular fabric had great stretch in one direction (with a pretty limited stretch in the other) – so I opted not to shorten the pattern just in case it hiked up while wearing it. After wearing them around for a day, I’ve found that they actually have enough lengthwise stretch so that they feel comfortable and don’t really hike up that much while wearing them. As for the waistband\cuffs, I used a remnant cottony-rayon type blend because it matched well…. unfortunately, I’ve found that this material doesn’t wear as well as a beefier cotton. Mostly because the material makes for a looser fit so I feel like I need to pull them up occasionally. I think I could have fixed this if I would have added the drawstring. Overall, this is a winner. I’m loving the camo and they’re extremely comfortable to wear! This entry was posted in Uncategorized on March 26, 2019 by stacy. With warm weather finally here, I decided that I needed a pair of shorts from the Pattern for Pirate’s Logger (you can see my previous version here). So I grabbed my pretty double brushed poly and gray cotton knit that I used for the Discoverer Tee and set to work. 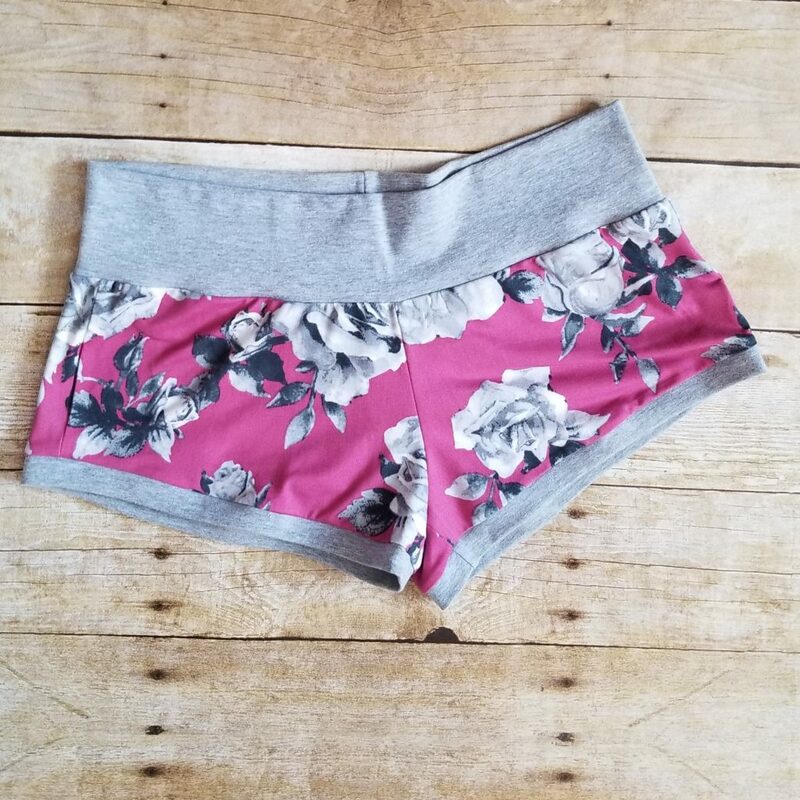 Let me start off by saying that I had some concerns when I cut out the pattern – it just looked tiny… but I went ahead because it really didn’t take much material to sew these up, so I figured I had nothing to lose. And when I was done? Well, I wasn’t wrong, they’re tiny. They also hit me in an unflattering place and consequently make my thighs look even bigger. Consequently, these will become sleep shorts (as a side note, these may be the most comfortable pair of sleep shorts I own so I’m not complaining too much about that!). While sewing these up was very easy, the end result was somewhat disappointing since I can’t wear them out of the house. They are cute, but I’m pretty sure that I have underwear with a similar coverage! This entry was posted in Uncategorized on March 25, 2019 by stacy. When my daughter was younger, she really didn’t care for me sewing for her… all that has changed now that she’s in college. Remember those Loggers I made this week? Gone. Honestly, I don’t mind because I love the fact that she’ll wear my creations – plus I can always make more! Speaking of more – look what arrived yesterday. My heathered camo french terry from Knitpop. I ordered this material late Monday afternoon and I had it in my hands on Wednesday. I washed it up yesterday and am ready to cut into it today! My only wish was that it had a bit of lengthwise stretch – I know that it’s going to ride up when I wear these some because it really doesn’t have much. I’m also intending on cutting out a pair of shorts from this pattern as well. It’s finally spring here and I know I’ll need them soon! This entry was posted in Uncategorized on March 22, 2019 by stacy. 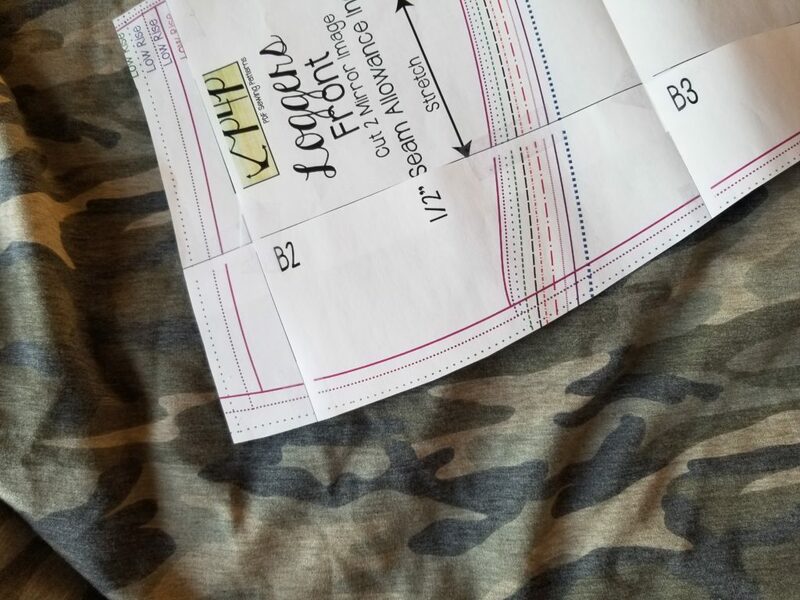 Hot off the sewing machine… Loggers! 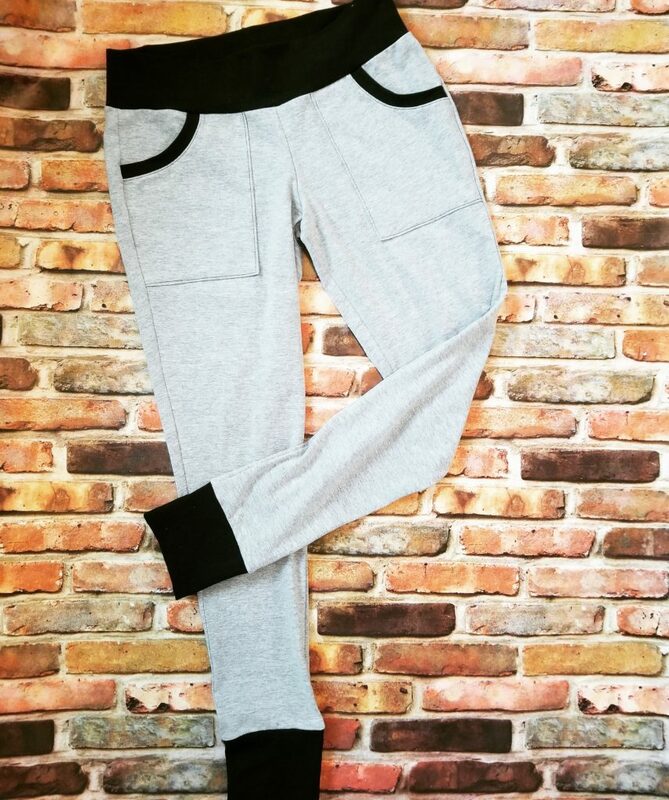 It’s as if leggings and joggers had a baby to make this fun little mash up. My first project of the week is Pattern’s for Pirate’s latest design, the Loggers. I really went round and round as to what size to cut out on this one because I have found that with this particular company, even though I measure one size, the next size up looks and feels a bit better. So, after much debate, I decided to split the difference and cut in between two sizes (although, honestly, there was very little difference in between most areas so I’m not sure it changed the fit much). I never could find a material in stores that I wanted to sew this project with (either they didn’t have the right “feel” or didn’t have enough\right kind of stretch), so I went with the gray cotton that I had used with the Discoverer Tee and a black cotton for the contrast. As for construction I went with the low rise pant with pockets, small waistband, and omitted the drawstring. Everything went together well and didn’t have any issues while sewing. So aside from this being a knit project, this would be a great pattern for beginners. And the fit? Not bad! I probably could have gone with the smaller size in this pattern, because it feels “loose.” Some of that feeling may be due to the fact that the fabric is pretty thin and just doesn’t “wear” like a legging material. Would I make this again? You bet! 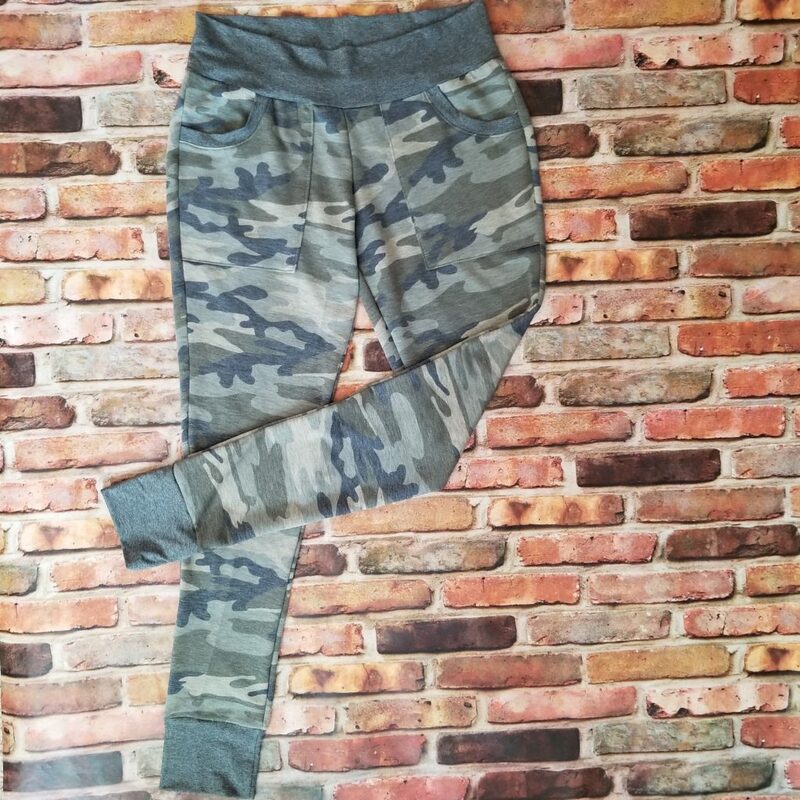 In fact, I decided that a beefier material might make for a better pant so I went ahead and ordered a heathered camo french terry from Knitpop. In the mean time, I think I’ll try the shorts. This entry was posted in Uncategorized on March 19, 2019 by stacy. Almost every morning Bret tunes into Sport Center. Recently, Nicole Brisoce wore a beautiful springy green top and I decided that I had to have it. After mulling over it all day, I determined that Jalie’s Adele was the perfect pattern to recreate her look… the fabric was a lot harder. I settled for a greenish matte silky\satin from Joann – not my ideal choice, but it’s close. I need more leggings like I need a hole in the head, but after a day of seeing everyone’s cute Loggers, I couldn’t resist…. plus I figured I had fabric in my stash to give these a whirl. I am restraining myself and making these in a solid fabric first (because I figure I’ll get the most use out of those and I have a lot of patterned leggings anyway). I’m also planning on making a pair of the shorts as well – but not promises those will be solid, too. I’m also still working on the Estes Dress Sew Along and have started working on a few “behind the scenes” projects as well. Now that my serger has returned, I’m ready to fire it up and see how it runs! This entry was posted in Uncategorized on March 18, 2019 by stacy.